A snake has defeated a crocodile in an epic five-hour battle at Lake Moondarra, in Queensland, Australia, which left onlookers shocked as the python slowly devoured its prey. The incident near Mount Isa was captured on camera by local residents on Sunday. 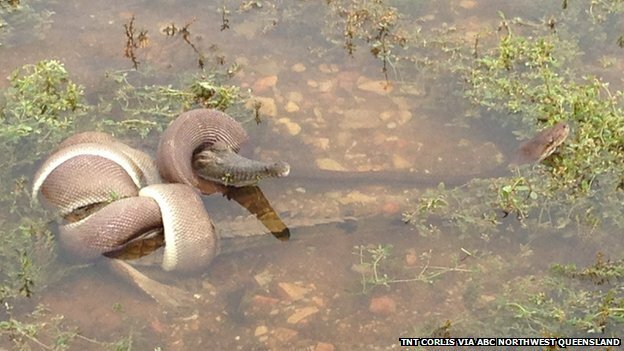 Tiffany Corlis said it appeared to take the snake around 15 minutes to eat the crocodile. Queensland is home to some of the world’s most dangerous snakes, as well as saltwater crocodiles.